Although one thing to bear in mind is that a strong contact network isn’t about how many people know your name – it’s about how many people will help you advance your career. Quality over quantity. It goes without saying that you need to meet the right people. Indeed. For that, you need to start by defining your goals and needs: what do you need to get from these contacts? A job or simply advice? From there, which types of places will you most likely meet people that can respond to these goals? Fairs, professional conferences or job club meetings? Once you reach these places, break the ice! In other words, get out of your comfort zone. Go on and make the first move by approaching the people you are dying to meet…Believe in yourself! It’s not necessarily easy, but you will get the hang of it. You meet the right people at the right places. You just have to make sure you are being proactive in doing so. Practice makes perfect. reference letters. They will help prove your contacts of what you are capable of! Make sure you always keep your reference contacts informed of your job searching process and thank them for the help they’ve offered you. Become a professional connector! With today’s online platforms, you don’t really have an excuse…Evidently, universally-known LinkedIn will be one of the main sources you will use. You can get introduced to new contacts through your connections and easily maintain an exchange with them. And don’t forget to use your everyday social media platforms smartly! Facebook, Twitter, and Instagram can lead you to build strong relationships too. 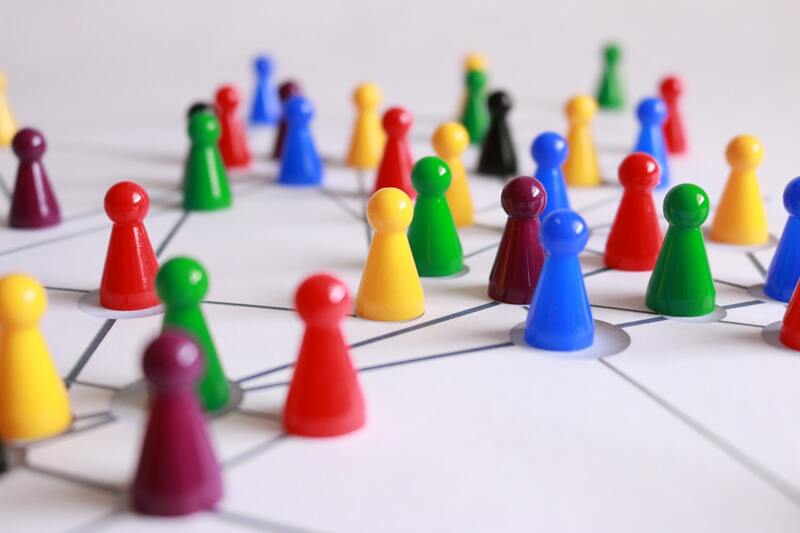 Given that Facebook has over 2 billion users, chances are you will find additional network opportunities… (Tip: try using the ‘People I may know’ on Facebook’s graph search) Also, remember when we were all connected to each other by six degrees of separation? Facebook announced in 2016 that there are only 3.5 degrees that separate us now. In other words, we are now connected to every other person by an average of 3.57 steps. Social media has brought us closer. Otherwise, on Twitter, master the power of the retweet: you never know which doors will open! Truly, there’s nothing difficult about connecting – look at it as a habit you need to add to your daily routine. Eat, sleep, connect…Repeat. The more diverse the better. By adding people from different industries, backgrounds, age groups, you open your chances to a broader range of insights, connections, and opportunities. A diverse network might also mean having different ‘genres’ of people, such as a mentor, a coach, a visionary, etc… See it this way: if you keep the same type of contacts, in other words with similar backgrounds and profiles, it limits your opportunities to expand elsewhere; to chances that you wouldn’t have thought of beforehand. However, the most important rule is to schedule time for your key contacts. Who are those who will contribute to reaching your goals and needs? For that, it’s best to keep a running list of the people you certainly need to reconnect with. It’s good to have a clear idea of the different types of contacts that consist of your network and which ones you want to contact ASAP. These key contacts might as well be your allies – in other words, the contacts you can rely the most on, that can consult you regularly with advice. Think of allies (almost) like your best friends: the ones you can count on at any given time. It’s necessary to follow up with your connections. Remind your valuable contacts that you care and that you exist. Don’t let them forget about you… And always follow up in a timely manner – if not, it will be perceived as unprofessional. It’s crucial for ensuring valuable relationships. Besides, it’s great to have strong connections, but if you don’t take the time to stay in touch with them, is there really a point in having them in the first place? Last but not least, remember this: adding a personal and different touch to your communicative exchanges is always good. It lets your connections know you are grateful for their presence and of their help. It shows appreciation, and, well, who doesn’t enjoy it? This might be either to send a handwritten note, which is a great way to show your appreciation, or even giving them a gift…Exceed their expectations as much as you can! To conclude, networking essentially means building relationships. Imagine building relationships as the seed for your development. It is rewarding and crucial for your success and personal growths. To see your seed grow, be consistent in networking. Consistency is key. If you belong to those who are nervous about making contacts, either because you’re uncomfortable or embarrassed, bear in mind that people actually enjoy giving advice and being recognized for their expertise. Everyone’s been there. They know what it’s like and how stressful it can be to find a job… So, rest assured, you are not alone. Now, network your way to success! Digital Marketer at Jobable. Interests in creative advertising, psychology and writing.